Solve the crime in a mansion, on a train, and in a boat! 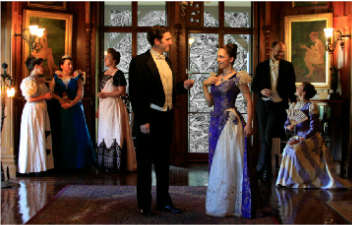 Step back in time for a Newport evening of intrigue, mystery, and fun. Hosted at the Newport Art Museum, our family-friendly, fast-paced 90-minute shows prove that no matter what the year or station in life, people are the same! The Newport Art Museum (John N.A. Griswold House) is an 1864 Arts and Crafts Stick Style mansion built by Richard Morris Hunt. 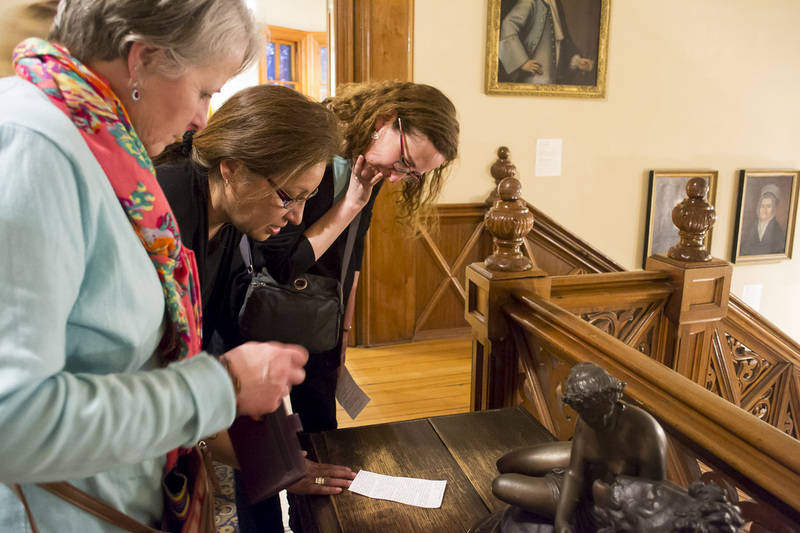 Filled with beautiful artwork, it is the perfect setting for our interactive intrigue! Step aboard for a fully interactive murder mystery during your dinner journey. Different scripts and multiple endings for each allows you can come back with friends and still be stymied by the twists, turns, red herrings, and surprise suspects all while you enjoy the fine dining, fabulous views and signature drinks. Newport Murder Mystery has partnered with ﻿Fish n' Tales Adventures to create a new high seas mystery on Friday evenings. These 90 minute, interactive mystery experiences aboard the Northeastern are a sure fire way to kick off your Friday night right! Discover the clues and piece together the crime! Experience Newport, Rhode Island in an exciting, unique and cost-effective way by participating in a 3-day Murder Mystery Getaway! This is the ideal all-inclusive excursion for tourists and stay-cation for locals, where you will be “treated like a queen, eat like a king, and play like a child.” Spend three days in luxury, play and suspense in the elegant and historic George Champlin Mason House, located in the heart of the City-by-the-Sea. Marley Bridges is operated by the Beechwood Foundation, the 501(c)3 nonprofit arts organization dedicated to fostering the arts, arts education, and historic preservation throughout Newport County. Your tax-deductible donation will support the Beechwood Foundation's perpetuity, which in turn will allow the MBTC to continue producing its year-round affordable programming including the "Murder at the Museum" series, summer theatre and one-act performances, and The Dickens Christmas Feast. Follow this link - http://www.crowdrise.com/beechwoodfoundationannualfund - to make your secure donation. Thank you for your generosity and support! I want to receive the email newsletter. I want to be a part of this crazy fun! I want a puppy. Recreate, Imagine & Play with us! We offer a wide array of solutions for all your mystery needs. We are Newport's most experienced and professional mystery engineers. From packaged, long running weekly shows to completely customized corporate and private party entertainments, we aim to awaken your inner sense of play and hidden desire to be a gumshoe! We are based in Newport but we love to travel. If you provide the venue, we will provide the villainy. Contact us with your request. Check out our newly updated (yet still in renovation) website, www.MarleyBridges.org for more information. We are always available by phone at 401-324-9436. Travel Bloggers at "Got a Passport" recently attended a 3 day Mystery weekend at the Architect's in and here's what they had to say. . .